Chancellor Boschini speaks at his annual town hall in March 2013. Photo by TCU 360. Chancellor Victor Boschini and the Board of Trustees met a week ago to discuss a number of topics ranging from construction updates, to parking issues, tuition increases, enrollment capping, Diversity, Equity and Inclusion, the potential addition of a Student Trustee, TCU and North Texas’ joint medical school venture and the status of the university budget. Over the years, TCU has been referred to as Texas Construction University. This year, the Neeley School of Business, the fine arts building, the performance hall, two residence halls and the eastside of Amon G. Carter Stadium are under construction. All but one – the stadium – are on schedule. Despite a promise that the stadium will be ready by the Horned Frogs’ Sept. 28 home game against the Kansas Jayhawks, Boschini is cautious. “I’m saying it’ll be ready by our fifth home game,” he said. As for the dorms near the King Family Commons, students have requested to live in them via the on-campus housing lottery, so the dorms have to be open for business next fall. Boschini said he and the board discussed a primary campus lament: parking. “I’d say in general parking is a no-win because everyone wants a space right where they want it,” Boschini said. “We have more spaces than the amount of parking permits we’ve distributed, so in theory there is a space for everyone, but it’s not where you want it. I totally get that. One solution that’s been discussed is building up like in New York City, constructing more parking garages, but that method will likely not be utilized. This year TCU had the largest first-year class in school history, a fall enrollment of 2,194. Despite TCU admissions dropping the acceptance rate to the lowest in school history, the department was still overwhelmed by more acceptances than anticipated. In the last two years, the tuition increases have been 4.5 and 4.9 percent, raising TCU’s yearly cost to $49,160 based on 12-18 hours of enrollment according to the Office of Financial Aid. It doesn’t seem likely that the cost of being a Horned Frog will hault its upward trajectory. “I always say, ‘No, I don’t see tuition being capped,’ but I could see it not going up as much every year, but the reason why it has to go up every is if you want to give raises and benefits to the faculty and staff each year and as long as students to continue to want more things, which they always do, I don’t see how we could ever freeze it,” Boschini said. He said the board supports merit-based scholarships, but those scholarships haven’t been increasing exponentially alongside need-based scholarships. After 77 percent of the faculty approved a motion to implement a DEI component to the core curriculum, the Faculty Senate Executive Committee will bring in representation from all schools and colleges by the end of the semester and a board committee will vote on the final implementation. Now, the discussion becomes how to add the component to the curriculum. At the most recent board meeting, the student relations committee submitted a proposal to have a student trustee on the board. The timetable is such that the chair of the board will appoint a committee to study the idea and then report back. Schools comparable in size to TCU like SMU, Tulane, Washington University in St. Louis, Duke and Wake Forest all have student trustees. Every Big 12 school, except for the University of Oklahoma and Oklahoma State, has student trustees. However, Boschini isn’t sure a student trustee necessarily enhances the voice of the student body. 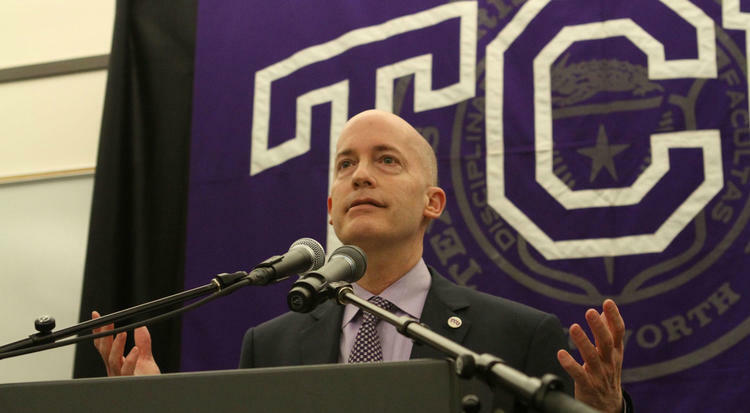 Boschini said even though the applicant pool was smaller than anticipated, the joint venture between TCU and UNT is comparable to that of the Dell Medical School at University of Texas at Austin. The single-day high watermark number was 650 applications.